Dining choices at the Resort satisfy every taste. Grab a quick snack or a flame-grilled burger, enjoy a sit down family meal with entertainment, or reconnect during a candlelit dinner for two. The Perk specialty café in the Country Store serves a wide selection of organic coffee drinks, teas, and smoothies perfect for pairing with delicious baked goods made locally. Getting ready for a full day on the slopes requires everyone to enjoy a hearty breakfast buffet at the Morse Mountain Grille, or a sampling of fresh baked goods at the Green Mountain Deli. On the run with afternoon activities might require some quick-fare options like a sandwich from our Green Mountain Deli. In the evening, gather the entire family for a fine dining experience at the Hearth & Candle, or keep it simple with pizza from our very own Village Pizzeria. Our surrounding community keeps the variety alive with fresh choices for breakfast, lunch, dinners, and even the latest in haute cuisine! The Hearth & Candle’s serves dinner nightly in a cozy setting right in the center of smugglers' Village. Seasonal menu items with locally sourced ingredients include an innovative selection of beef, poultry, and fish. After dinner, satisfy your sweet tooth with a triple chocolate truffle cake, cheesecake, or Vermont apple crisp. Dining rooms available for family friendly and adults only dining. Children's menu available. The Snowshoe Adventure Dinner is one of our most popular programs, a dramatic and delicious dining experience atop Sterling Mountain (18 & older please). The Sterling lift transports you to The Top of The Notch, a mountain cabin lit only by candles. The renowned Hearth & Candle Restaurant serves a gourmet meal with appetizer, salad, choice of main course and a famous dessert. After dinner, work off those calories with a 40 minute snowshoe down to the Base Lodge. Click here for more details. $85 per person, includes lift access, snowshoe rental, and dinner. Advance registration at The Guest Service Desk is required. Sign-up deadline Tuesday at 12:00 noon. Minimum sign-up is required for trip to run. Transportation to the Base Lodge leaves from the Village Welcome Sign at 4:15 pm. Function will be cancelled in the event of severe weather. A hearty Vermont breakfast is a morning favorite with a selection of pancakes, the Grille's unique French toast, omelets, meats, baked goods, fruit and more. Click here to check out the Mountain Grille's breakfast menu! Lunch includes appetizers and a wide variety of sandwiches, soups, salads, and housemade burgers, The Grilles' signature grilled flatbreads are a tasty appetizer prior to lunch or dinner; or with a side salad for a meal. Try the Vermont Flatbread; it is delicious! Dinner features an array of beef, fish, poultry, pasta and vegetarian dishes, with delicious Vermont products such as cheese and meats incorporated. Relax in front of the fieldstone fireplace in the Pub with a special beverage and munchies and watch the skiers and riders sliding down Morse Mountain. Be sure to check out the great wine by the glass options, full wine list, and the Little Smuggs Fun menu. Check out the Mountain Grille's special kids menu for lunch & dinner! Yummy entrées such as housemade cheddar mac & cheese and pasta, lots of sides, plus recipes and games! Monday, 5:00 pm - 8:00 pm The Friendly Pirate Dinner Ahoy! Set sail for a thrill at the Mountain Grille with silly chanteys, jaunty jigs, and jolly jokes. Rockin' Ron the Friendly Pirate and Mogul Mouse will be on board! See FP Breakfast details below. SCHEDULE NOTES: This event will be replaced by other events on Monday, December 24th and December 31st. This event also moves from Monday, January 14th and January 21st to Tuesday, January 15th and January 22nd. .
Tuesday, 5:00 pm - 8:00 pm Marko's Tableside Magic! Marko the Magician goes table to table performing magic in the Morse Mountain Grille while you dine. (Maybe he can teach the kids to make their veggies magically disappear). SCHEDULE NOTES: This event moves from Tuesday, December 25th, January 15th and January 22nd to Monday, December 24th, January 14th and January 21st. Friday, 8:00 am - 10:00 am The Friendly Pirate Breakfast! Yo ho ho it's a hearty breakfast me hearties at the Grille with a heaping helping of pirate songs, dances, and joyful jokes! Rockin' Ron the Friendly Pirate plays songs from his GRAMMY(TM)- nominated album "The Flying Pirate Circus," as well as the critically acclaimed collections "Give Me an RRR!" and "Pirate PaRRRty!". His illustrated children's book also called "The Flying Pirate Circus" is available at 3 Mountain Outfitters, The Country Store, and Treasures. Check out the newest addition at the Country Store — The Perk! Serving espresso, cappuccino, lattes, chai tea, mochas both hot and cold. A variety of fresh fruit smoothies, iced tea, and lemonade. Offering a variety of morning pastries and fresh baked goods prepared locally. Pastries will include cinnamon buns, scones, biscotti, muffins, Danishes, cookies, and much more! Enjoy fresh-baked pizza with all your favorite toppings! Our menu includes pasta dishes and Italian specialties as well as stuffed breads, calzones, fresh salads, garlic bread, pizza-by-the-slice, beverages, and more! Full bar available for dining in. Counter service to dine in or take out. Click here to check out the Village Pizzeria's menu! Mogul & Billy's Pizza Party Mogul Mouse & Billy Bob Bear hook up with Rockin' Ron the Friendly Pirate at the Village Pizzeria for music, dancing, and merry making. Oh yeah, it's a paRRRty! The pizza's not free, but the fun is! Enjoy fresh baked cookies, muffins, pies and light breakfast items. Start your morning with a hot cup of coffee, flavored coffee or cappuccino. Lunch features freshly made sandwiches, salads, vegetarian options and specials daily. Special occasion cakes made to order with 24 hours notice. The Green Mountain Deli is located in the Village Lodge. Ben & Jerry's is Vermont’s Finest Ice Cream. The only full scale resort Scoop Shop anywhere is scooping more than 15 unique and fun flavors to choose from... try a different flavor each day of your stay! Tempt your tastebuds with a selection of ice cream flavors, sorbets, and low fat frozen yogurt in cones, sundaes, or shakes. You can’t miss the Scoop Shop located downstairs in the Village Lodge. Our smoke free lounge features a wide selection of beers, a full service bar, munchies, a big screen TV and nightly adult entertainment. At various locations on our mountains, we offer a variety of dining options, as well as other necessary services. You will find everything you need to have a fun and relaxing day on the slopes. These facilities are open throughout the Winter season based on lift operation schedules. Serving breakfast, lunch, beverages and snacks. The Black Bear Tavern is a full service bar enhanced with a large selection of draft beers, including Smuggs own Prohibition Ale. It also has the full Green Peppers menu available with waitstaff service. Appetizers, soups, sandwiches, hearty Winter fare and more. Experience the great camaraderie between local and visiting skiers and riders. Après Sport parties Friday - Sunday at 2:00 pm. Enjoy a grab-and-go slopeside treat at our new Waffle Cabin located near the Madonna II lift. Baked fresh and on demand, the enticing aroma will draw you in and the taste will keep you coming back. Refuel at the top of Sterling Mountain (elevation 3,040 feet) and enjoy some of the tastiest homemade soups, a variety of wraps, hot chocolate, candies, and beverages. For convenience that can't be beat, try the Morse Highlands Day Lodge for a continental breakfast before hitting the slopes. Slightly removed from the rest of the resort, you'll feel like you're at your own private ski area. 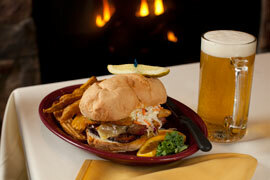 In addition to restrooms, phones, Ski Patrol & First Aid, the lodge also serves lunch, beverages, and snacks. There is no day parking at the Morse Highlands Day Lodge. The lodge is accessibly by shuttle or the Dixie's Knoll trail adjacent to the Morse Highlands lift.